Delegates to the Oklahoma Republican Party's State Convention on April 11th will be choosing between at least three candidates for State Chair: Randy Brogdon, Pam Pollard, and Dave Weston. Like I did in 2013, I contacted each of the individuals, and they have all filled out a survey that I hope will help delegates be more informed for the convention. I will be posting their responses over the coming days. I have been married to my high school sweetheart Donna for 42 years. We have two sons, two daughters-in-law, and our first grandchild Jack is 5 months old. I have attended Woodlake Church in Tulsa for 47 years. Over the years I have served as a Sunday school teacher, deacon, youth leader, and even janitor. I owned a small business for over 30 years in the air conditioning industry. 2. What is your past and present involvement with the Republican Party (from precinct-level to RNC)? If possible, include approximate dates. I registered as a Republican at 18 years old in 1971. I served the Republican Party as the State Platform Chairman for the State Conventions in 2006 and 2008. In 2014, I along with a few others, refined and defined the principles that we as a Party now prominently display. 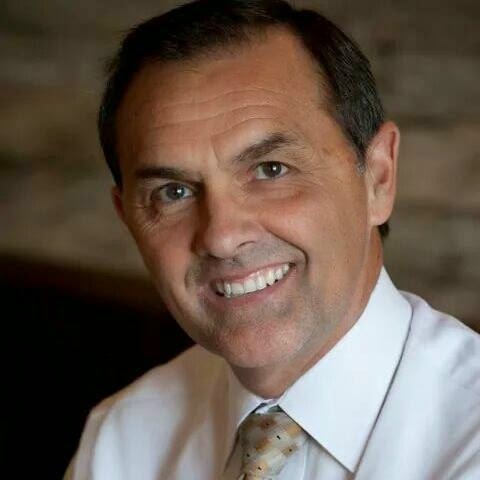 I have attended precinct meetings, county conventions, and state conventions for many years and have served in a number of roles throughout those years. 3. What political involvement have you had outside of the Republican Party (i.e. campaigns, elected office, political groups, etc.)? If possible, include approximate dates. My entrance into public service began by serving for three years as a city counselor in Owasso. I won a three way race by 50% plus one vote to avoid a runoff. I also served as Mayor of Owasso. I served in the Oklahoma State Senate from 2002-2010. The Senate Republican caucus twice elected me to leadership positions, first as a Whip and then as Assistant Floor Leader. In 2006 I led a statewide campaign to reign in government spending via a ballot Initiative called The Taxpayer Bill of Rights (TABOR). We collected over 300,000 ballot signatures in 90 days. I left the Senate having the highest conservative voting record, scoring 100% seven of the eight years with a life time average of 93%. Since leaving office I have been involved in a number of grassroots organizations promoting the principles of limited government. 4. What prompted you to run for chairman this year? After a number of fellow Republicans from across the state urged me to consider a run and after much prayer and deliberation, I decided that running for State Party Chairman would provide me with another opportunity to serve our Republican Party once again. As Senator I was able to pass conservative legislation under Democrat control, which shows that not only am I able to work with those I may not agree with, but that I am capable of sharing conservative Republican principles in a way that appeals to many different types of people. As a small business owner for over 30 years, I have the executive experience that our State Party deserves. I believe that my years in the private and public sectors gives me an advantage in helping to further the goals of our Republican Party. 5. What do you view as the top three duties of the state chairman? The State Party Chairman has many roles and responsibilities. One is to enforce and uphold the rules of the Party and carry out the directions and resolutions of the State Committee. A strong State Party is reliant on a strong and educated State Committee as well as informed County officers. The Republican Party Chairman has a responsibility to disseminate information to all within our party. Whether you are a precinct activist, a candidate, or a county party officer, you should receive the same courtesy and information the Party has to offer. I will work to see that all of our committees and counties have the proper information and education while tackling the issues we face. From proper party finance reports to regular party updates, I will work to ensure the right information gets to those who need it most. The Chairman also has a responsibility to assist in National and State campaigns. As Chairman I will never interfere in primaries or work against those who decide primaries are a necessary action. I believe that all of our Republican candidates deserve the same respect from our State Party. Once the Republican primary voters decide on a Republican nominee, I believe it is vitally important to work with the nominee and their campaign team, not around them or above them, to ensure they have the necessary support and resources to reach victory. Support and resources can mean a number of things; up-to-date data within their district, social media support, volunteers, and of course donations. Unfortunately the state party was absent in the donation category this last election cycle having gave no donations to any Oklahoma Republican. I would take the path of my friend, former State Chairman Matt Pinnell who distributed checks to every nominee in the 2012 campaign cycle. I believe that a well-rounded State Party will produce stronger Republican campaigns across the state. It is also the duty of the Chairman to appoint the secretary, treasurer and general counsel of the Party. In order to help build existing county parties and to fill vacant county seats, we must have a State Party office that is in direct communication with our Republican leaders from across the state. As State Party Chair I will see to it that my office is accessible, reliable, and available to all of those who need our support. 6. What are your top priorities if elected chairman? I will actively work to restore confidence in the Republican Platform. The most effective way to do so is to share the principles of our Party. The chairman must be able to effectively communicate not only what is in the platform but also how those principles make our lives better. The chairman should be able to articulate our Party principles whether to the media or to the general public. I believe that when our party base recognizes that they have a Chairman who is willing to promote these principles, the Minute Man fundraising program will once again be a vital way to collect small donations from across the state. One of the most compelling features of the GOP is its diversity. From its formation, the identity of the Republican Party could be found in the free thought of its members. We are not now, and have never been monolithic in our thinking. Unification is not accomplished when everyone thinks alike, rather Party unity is realized when everyone has the freedom of expression within our party structure. Open and fair debate is critical if we are to unify the GOP around our principles, and open debate should never be muted at our conventions. Another way to unify our Party is to aggressively share our values with minorities, Hispanics, African-Americans, and the younger generation. The principles of Limited Government and the Expansion of Liberty, transcends all cultures and age groups. As State Party Chairman I will share the values of our Party and help to unify through growth. As Chairman I will lead the effort to energize the grassroots around the state to become more active in the Republican Party. Our party structure is designed to be led by the people. Just as the government is supposed to be, of the people, by the people, and for the people, so is the Republican Party. As Chairman I will serve the people within our Party by giving them the necessary support and tools needed so they can be better equipped to be successful in their endeavors to promote and expand their county party and while working for Republican nominees. 7. Fundraising is an important aspect of running the state party. How much do you expect to need to raise to fully fund effective party operations, and how do you intend to approach fundraising for that goal? Party fundraising is currently down from previous years. I will improve the fundraising efforts by implementing a three tier strategy consisting of large donors, elected officials, and grassroots. One way to get grassroots Republicans, the base of our Party, to once again have enough trust in the Party to donate is found in involvement. Not only should the Chairman be involved with his party and its members, but those who have a desire and willingness to serve our Party should be encouraged to do so. I believe by being an accessible, reliable, and available Party Chairman and by encouraging participation and unity; we will once again have a strong showing of small donations. The most current Party budget was set upwards of $500,000. After taking office my first priority would be to sit down with the team and go through every detail. With 2016 right around the corner, we must have an appropriate budget and strategy to be able to stop Hillary Clinton or Elizabeth Warren from taking the Presidency. 8. The individual elected at the state convention will be in office for the 2016 presidential primary. Do you have any plans to increase Oklahoma's influence in the primary process, or to attract more visits by the candidates? While I believe it is not the proper role of the chair to interfere in primary elections- in particular the Presidential process- there is a great opportunity to use the Republican Presidential primary to engage Republicans from across the state and raise money here in Oklahoma. As the reddest state in the nation each candidate should be making appearances to introduce themselves to voters here in Oklahoma. Additionally, because people tend to follow Presidential politics more than local politics, the 2016 primary is a perfect time to reach out to newly registered Republicans who want to get involved but simply don't know how. It is also important that we create a support framework to ensure those Republicans remain engaged once we successfully place a Republican in the White House in 2016. I am excited to announce that a number of my peers and colleges from National, State-wide, and local offices have decided to endorse me in my run for this position. A few of those leaders include State Senator Anthony Sykes, and State Representative Jason Murphey. I am greatly honored to have their support, and I look forward to working with them in advancing the goals of our Republican Party. Over the next several weeks I will be releasing more endorsements from Republican leaders. Be sure to visit www.RandyBrogdon.com like my Facebook page at www.Facebook.com/RandyBrogdon and follow me on www.Twitter.com/RandyBrogdon to find out who they are. 10. Here's your closing statement - cover whatever you want to talk about. Ronald Reagan once said a great leader isn't necessarily one who does great things, rather a great leader is one who inspires others to do great things. The last 20 years of my life I have focused on conservative policy, now my focus will not be so much on the policy side of things, but on the people side. I am ready to round up the troops and prepare them to battle for conservative solutions in the war of public debate. We hear a lot about the rising numbers of registered Republicans in the state, and while that is a good trend, my goal will be to raise the number of Republicans active within the Party; precinct, county and state. I believe that in order to prevent a Colorado type flip from red to blue, we must have educated and engaged activists who are willing and able to go out and do great things. Our party was birthed by those who had desire to protect our God given rights of life, liberty, and property. Promoting the ideals of free market principles, self-reliance and responsibility and diversity of thought, will make our party stronger. Debating issues while sharing our values is a sure way to inspire the party faithful, and a great way to attract minorities and millennials who believe with us. I would appreciate your support and your vote on April 11th. 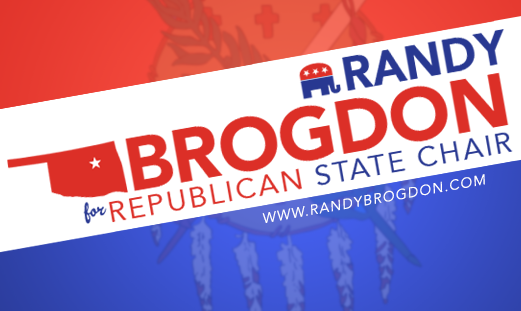 If you stand with a stronger Oklahoma Republican Party, let us know by using the hashtag #OKGOPUnite on social media and be sure to visit www.RandyBrogdon.com. Thank you for participating, Randy. Stay tuned for the surveys from fellow chair candidates Pam Pollard and Dave Weston.